James J. Tissot (1836-1902, French artist and illustrator), detail of "David Singing" (1896-1900), watercolor. Psalms 57:7. Larger image. David, the shepherd boy of the Bethlehem hills, loved to sing, sang to his sheep. Over the years he grew into a gifted songwriter, a poet. And then, when he was but a teenager, the Prophet Samuel came to his family's farm and poured oil over his head, anointing David King of Israel. From that moment the Holy Spirit of God poured over him as well. His gift of song and poetry took on a new level of inspiration. Over the next 600 years other God-inspired poets gave voice to psalms, completing the collection of psalms that we know today as the Book of Psalms, the Psalter -- 150 poetic songs that lie at the heart of our Bibles. The Psalms express the entire spectrum of human emotion -- fear, despair, longing, love, hope, joy, and exultation. They also instruct us in how we can voice our own prayers and praise to God. 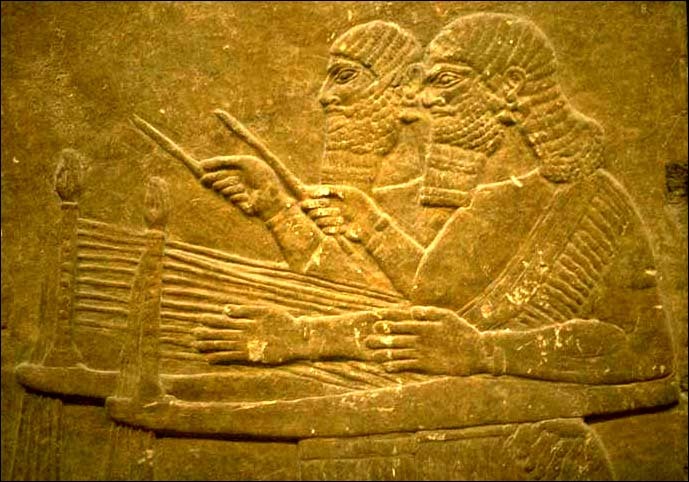 Captive musicians from the siege of Lachish sing praises to the conqueror. Detail of relief from SW Palace of Sennacherib at Nineveh, ca. 701 BC British Museum, London. Larger image. The word Psalm (Greek psalmos) translates the Hebrew noun mizmôr, "song, instrumental music," from the verb zāmar, "sing, sing praise, make music." It reminds us that the Book of Psalms was -- and is -- intended for singing. This was the church's first song book. Though we have lost the original tunes, individual psalms have been put to music many times since. The ancient songwriters were devout poets who put their heartfelt devotion toward God into verse. Synonymous Parallelism is the most common form of parallelism. Here the idea of the first line is reinforced in the second line. You can find parallelism in Jesus' teaching, too (for example, Matthew 5:43-45). But scholars have realized rather recently that synonymous parallelism is something of a misnomer. The lines are not strictly synonymous. You might describe it as "A, what's more B." The second line always seems to carry forward the thought found in the first phrase in some way.2 This progression is sometimes subtle, but often quite obvious. The second -- or sometimes third line -- reinforces and extends the meaning of the first, like a second wave that mounts higher than the first, and a third even higher yet (for example, Psalms 92:9; 93:3; 145:18). When interpreting Hebrew poetry however, it's important not to overemphasize the nuances between the similar words, for example, between "man" and "Son of man" in 8:4 or "my soul" and "my flesh" in Psalm 63:1. As Kidner puts it, "They are in double harness, rather than in competition. "3 Rather look for the ways that second idea builds upon the first. Antithetic Parallelism is also common. The idea in the first line is contrasted or negated in the second line as a means of reinforcing it. It is found most commonly in the Proverbs and in the didactic psalms. In addition to these two common forms of Hebrew parallelism, scholars have found a number of other less prominent varieties. Hebrew poetry was a fine art that we are just beginning to appreciate more fully. A second common characteristic of Hebrew poetry is its use of imagery, comparing one thing to another. Of course, imagery can be found in prose sections of the Old Testament and it is not found in every psalm, but it is especially rich in Hebrew poetry. Imagery has a way of fixing an idea in our minds with clarity. 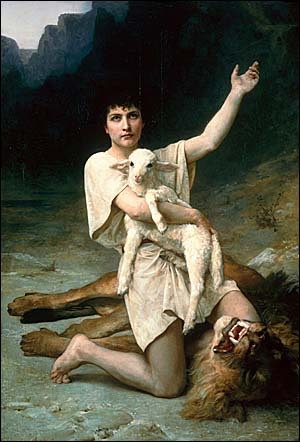 Elizabeth Jane Gardner (1837�1922), "The Shepherd David, " (ca. 1895), oil on canvas; 61 1/2 x 42 3/8 in. (156.2 x 107.6 cm), National Museum of Women in the Arts. Larger image. Think about the images in the familiar 23rd Psalm. In prose we might say with some accuracy: "God meets all our needs and protects us." It is true, but not particularly memorable. The power and beauty of the 23rd Psalm is the way that it communicates these ideas through images: shepherd/sheep, green pastures/still waters, the valley of the shadow of death, a table, an anointing, and an overflowing cup. These images in our minds with the thoughts and emotions they evoke contribute to make this psalm an all-time favorite. A metaphor communicates a more vivid image than a simile because it is implicit and draws the comparison more closely. As you study the Psalms, be aware of the images that are used and the thoughts and emotions that they are intended to evoke in us, the readers. The Hymn, recognized by its exuberant praise of the Lord. Examples are abundant, such as, Psalms 8, 19, 29, 33, 47, 48, 92, 96, 103. The Lament, the polar opposite of the hymn on the emotional spectrum. Lamentations begin with a complaint, but often conclude with praise. Within a lament you may find several of the following elements: (a) invocation, (2) plea to God for help, (3) complaints, (4) confession of sin or assertion of innocence, (5) curse of enemies (imprecation), (6) confidence in God's response, and (7) hymn or blessing. Examples include: Psalm 3, 7, 13, 25, 22, 42-43, 44, 51, 74, 79, 80 and many others. Psalms of Confidence, an expression of the psalmist's trust in God's goodness and power. Examples include Psalms 11, 16, 23, 27, 62, 91, 121, 125, 131. Psalms of Remembrance make reference to the great redemptive acts of the past, particularly the Exodus (Psalm 77:16) and the establishment of the Davidic covenant and dynasty (Psalms 89, 132). Examples are found in Psalms 78, 105, 106, 135, 136. Wisdom Psalms tell us in concrete ways how God wants us to live our lives. This kind of literature is found in Proverbs, Job, and Ecclesiastes. But it is also found in several psalms, such as Psalms 1, 19, 37, 49, 119. Of the 150 psalms, 116 include an extended title or an ascription that is part of verse 1 in the Hebrew text. While not part of the original text, they were probably inserted by editors fairly early -- certainly long before the second or third century when they were translated into Greek. "For (le) the director of music. Of (le) David the servant of the LORD. He sang to the LORD the words of this song when the LORD delivered him from the hand of all his enemies and from the hand of Saul. He said...."
We do know that David was closely identified with worship music. 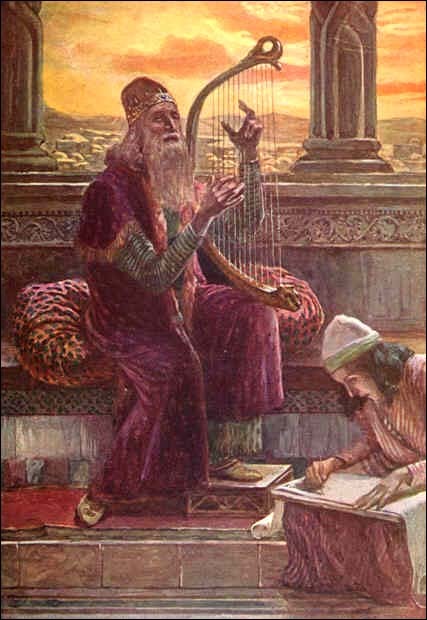 He sang to calm King Saul (1 Samuel 16:14-23; 18:10-11), accompanying himself on a lyre or harp. 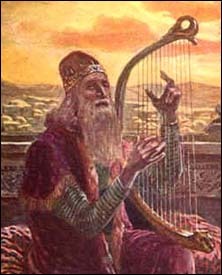 He is called "the sweet psalmist of Israel" (2 Samuel 23:1), and is named as an inventor of musical instruments (Amos 6:5). Egypt, Babylon, and Canaan all had developed psalmody before and during Israel's residence in Palestine. Psalmody was known from the earliest times in Israel, such as the Song of Deborah (Judges 5) from about 1150 BC. It is even possible that some of the psalms in our Psalter predated David. Some of the allusions to the temple could possible refer to the tabernacle at Shiloh, known as the "holy place" (Exodus 28:43; 29:30), "the house of the Lord" (Joshua 6:24; 1 Samuel 1:7ff; 3:3; cf. 2 Samuel 12:20). It is difficult to imagine that psalms mentioning the king or the ark could have been first composed after the exile. The traces of Aramaic found in some of the psalms are no reason to date them late, since Aramaic was known in Jerusalem as early as the eighth century BC. The presence of Ugaritic language affinities are witness to the early date of many of the psalms. The Psalms could have been written no later than the translation of the Greek Septuagint 300-200 BC. Pre-Exilic, written during the period of the Kings prior to the Exile (1000-600 BC). This would include the royal psalms, those which mention the existence of the northern kingdom, and those with greater affinity to Ugaritic language and syntax. David who reigned approximately 1010-970 BC was by all accounts the most prolific author of psalms. Exilic, those written during the exile (605-537 BC). This would include some of the dirge or lament psalms and perhaps those mentioning the betrayal of Judah by her enemies. Psalm 137 recalls this period: "By the rivers of Babylon we sat and wept when we remembered Zion...."
Post-Exilic, written after the Exile (537 to about 400 BC). This probably includes psalms about the righteous sufferer, how the Torah should be observed, wisdom, and cautions against atheism. While the dating of the Psalms seems to be between 1000 and 400 BC, editing took place somewhat later, but by the time the Septuagint was translated. Psalms begins deliberately with a psalm designed to urge the reader to study the Psalms with the same diligence as one studied the Torah. As the Hebrew Bible developed, it was divided into three sections: The Law (the Pentateuch, Torah, first five books of the Bible), the Prophets (the historical books, and the major and minor prophets), and the Writings (Job, Psalms, Proverbs, Ecclesiastes, Song of Solomon). Some psalms scrolls found at Qumran contain both psalms that appear in our Bibles and psalms that "didn't make the cut." However, the canon of accepted psalms in the Hebrew Bible seems to have been fixed by the time of the translation of the Septuagint in the third and second centuries BC, since it is very similar to the Book of Psalms in the Masoretic Hebrew text that forms the basis of our modern Bibles. The chapter numbers were added much later in the 13th century AD. Up until that point, individual psalms would be referred to by their first line rather than their chapter number. When Jesus from the cross quoted Psalm 22:1 with the words, "My God, my God, why have you forsaken me?" he was probably calling the whole psalm to mind, which included the phrase "they have pierced my hands and my feet...." (22:16b). Adding chapter numbers and verses should have clarified things, but in some ways they've confused matters. For example, while the Hebrew numbering counts a psalm's inscription as verse 1, our English versions number from the verse following any inscription. Another confusion comes from slight discrepancies between the numbering of the Hebrew and Greek versions of Psalms. Modern Protestant and Roman Catholic translations are based on the Hebrew numbering, while the Catholic lectionary and Eastern Orthodox translations are based on the Greek numbering. Some of the intriguing aspects of the psalms are technical terms which often appear in the ascription. Unfortunately, there's lots of speculation but not much firm knowledge about most of these. There are a number of designations that we can only speculate about their actual meanings. The following two, however, seem fairly well established. To the Choirmaster (nāṣaḥ), "chief musician" (KJV), "leader" (NRSV), "director of music" (NIV) occurs in 55 psalms. The Hebrew root (nāsaḥ) means "to excel," thus "to superintend," so "choirmaster" seems like a reasonable translation.17 Again, we're not sure what it means. A Song of Ascents (Psalms 120-134), ascribed to 15 psalms, probably referring to the pilgrimage up to Jerusalem, or the processional ascent of "the hill of the Lord" (Isaiah 30:29).18 They were used particularly during the Feast of Tabernacles. Hallel Psalms (Psalms 146-150) were for more general use in worship. Before we conclude our introduction to the Psalms, it's important to mention a wrong turn in twentieth century Psalms studies. As mentioned above, Gunkel's categories of Psalm forms came out of a study of literature of other Near Eastern cultures and, as a whole, has been helpful in better understanding the Psalms as literature. However, this comparative religions approach led several leading scholars, beginning with Gunkel and Mowinckel, to argue that a high percentage of Israel's psalms must be related to an Israelite New Year Festival, celebrated in the autumn, in which the Lord's kingship was annually reaffirmed over the forces of chaos. This hypotheses relies on the existence of an Israelite festival corresponding to the Babylonian Akitu festival. However, there is nothing in the Psalms or the Old Testament that suggests celebration of such a festival in Israel.20 Arthur Weiser later modified this hypothesis to the celebration of an autumn covenant festival, but the evidence of such a festival just isn't there. The unfortunate result is that the commentaries that adopted these hypotheses are much less useful than they would have been if they had limited their search for a life-setting within the history and culture of Israel itself. The emphasis on determining the life setting (Sitz im Leben) of a psalm is good, but the fact is that most of the psalms just don't provide much context to the reasons for their composition and we must accept that limitation rather than import speculative theories to "guide" our interpretation. Jesus too regarded the Psalms as inspired Scripture. Jesus interpreted Psalm 118:22 as predictive prophecy concerning himself (Matthew 21:42-43). Hopefully this rather academic introduction doesn't ruin the Psalms for you. Ultimately they find their highest use in inspiring believers to trust in God in spite of the tough times we may go through in our lives. And in that role of inspiring us humans, some of the psalms in our Bibles are old enough to have done admirably for a full three thousand years. How about that for enduring value! Longman, How to Read the Psalms, p. 108. He cites his article, "A Critique of Two Recent Metrical Systems," Biblica 63 (1982):230-254. Longman, How to Read the Psalms, pp. 97-98. Kidner, Psalms 1-72, p. 2. Longman, How to Read the Psalms, pp. 107-108. For a helpful examination of prayers in neighboring cultures, see Tremper Longman III, "Ancient Near Eastern Prayer Genres," in Firth and Johnston, Interpreting the Psalms, pp. 41-59. Longman, How to Read the Psalms, chapter 19. Craigie, Psalms 1-50, p. 35. Kidner, Psalms 1-72, p. 33. This section draws on material from Harrison, Introduction, pp. 983-985 and lecture notes from David J. Cline. David M. Howard, Jr., "The Psalms and Current Study," in Firth and Johnston, Interpreting the Psalms, pp. 25-29; and Gerald H. Wilson, "The Structure of the Psalter," Ibid., pp. 229-246. Gerald H. Wilson, Ibid., p. 229. Kidner, Psalms 1-72, pp. 36-37. Kidner, Psalms 1-72, p. 37. Herbert Wolf, hāgā, TWOT #467c. Kidner, Psalms 1-72, p. 37. Kidner, Psalms 1-72, p. 37; Herbert Wolf, śākal, TWOT 2263b. Kidner, Psalms 1-72, pp. 40; Milton C. Fisher, nāṣaḥ, TWOT 1402. Kidner, Psalms 1-72, p. 43. Joachim Jeremias, The Eucharistic Words of Jesus (Oxford: Basil Blackwood, 1955), pp. 30-31, especially fn. 1 on page 31.